Micro dynamics: Don't over-compress the mix so that the mastering engineer has nowhere to go. Apple music has a target level of -16 LUFS. If you compress above this level, transients lost cannot be regained at mastering. Obviously this is a creative choice. Try using MasterCheck to audition at the service playout level and compare against reference audio at the same level to hear your mix in context. Macro dynamics: Loudness is not a momentary ceiling, it's an average value for the entire track. It is perfectly possible to have very loud sections within a song as long as these are balanced out by softer sections. Place MasterCheck on the output bus and select a relatively low bandwidth codec to monitor. Switch MasterCheck into mid/side mode and then solo the sides. The sides will now clearly be exhibiting all kinds of musical noise - encoding artefacts. Flick between monitor and metering to hear the original sides vs encoded. Once you are confident you can detect the encoding artefacts, switch back to the full mix and if you listen carefully, you will be able to resolve these artefacts in the full mix too. Keep on tuning your ear using higher bandwidth settings and different codecs. 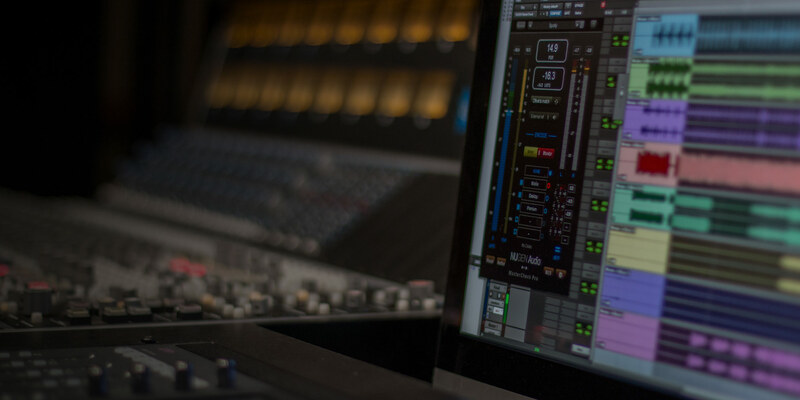 Avoiding codec distortion When working with hot audio, MasterCheck can be used to identify potential codec distortion prior to submission to streaming services. Try using the codec selection panel to audition and monitor your audio through different streaming codecs. The individual meters to the right indicate the True Peak output after encoding. Unlike traditional limiters, ISL can be used to measure the inter-sample peaks that fall outside of individual sample points, and result in distortion when incorrectly reconstructed by down-stream codecs. Try using ISL to specify the output True Peak limit and preempt these inter-sample peaks, and avoid potential codec distortion in music service streams further down the line. Monitoring mid/side compression MasterCheck can be used in mid/side mode to examine the mid/side relationship of the PLR (Peak to Loudness Ratio) values when using mid/side compression techniques. Click the ‘M/S’ button in the plug-in to switch the metering into mid/side mode. When mid/side is active, the bar meters will split to show mid and side readings instead of left and right. In this mode, the main PLR and program loudness values are still derived from the complete stereo mix, only the bar meters switch to Mid/Side. This feature proves very useful in situations where independent processing of mids and side audio is required, whilst at the same time contextualising the mid/side information with the overall loudness readings. Comparing to reference material MasterCheck can also be used to compare your tracks to reference material in order to measure the differences in loudness, PLR and True Peak readings. The NUGEN Audio SEND plug-in is installed with MasterCheck. This can be used to 'tap' the signal at any point in the chain and send the audio through MasterCheck. To make a comparison between your audio and a reference track, create a new track with your reference audio and insert the SEND plug-in on this track. Place MasterCheck as you usually would to monitor your mix and click the 'External ref.' button. MasterCheck will now replace the target loudness value in the bottom left with the loudness measurement from the reference track. The PLR of the reference track will also be shown in the PLR window. You can monitor the reference audio by clicking the speaker button. If you wish, you can use the 'Offset to match' control to match the loudness of your material to the reference audio. As these values are constantly updated, there may well be some drift over time. Use the circular refresh button to recalibrate if required. Removing loudness from an FX chain Using MasterCheck to remove loudness from an FX chain can be a very useful technique to employ when trying to evaluate the effect of processing without being influenced by the 'feel good factor' of increased loudness. Generally speaking, if you turn up some audio, it sounds better. This can be problematic when attempting to make an objective assessment of any form of processing that affects the loudness (e.g. a compressor or limiter), because the loudness increase alone will make things sound better. MasterCheck can be used to 'remove' the loudness difference by matching loudness before and after effects, so the effect without loudness can be auditioned, making it much easier to assess the contribution of the processing involved. The process is very similar to comparing your audio to reference material (see above) except we are now comparing with the same track, before and after processing. Place MasterCheck at end of plug-in chain. Place Send plug-in at start of chain (check 'Audio Thru' in Send plug-in). Play audio and click 'Offset to match' to remove loudness differential. Use the speaker control to A/B before and after. In the final article of our series on producing for streaming services, it's time to put what you've learnt into practice. Read on for some essential mix and mastering tips for the streaming age. The same considerations apply, however it's now important to think about loudness and True Peak levels together. A playout system will have both a loudness level and a maximum True Peak level which avoids distortion in the codec employed. This can be thought of as a letterbox that you are posting the audio through. If you get it right, your audio slides through, if not, the system will make it fit - something probably best avoided. When working with hot audio, MasterCheck can be used to identify potential codec distortion prior to submission to streaming services. Try using the codec selection panel to audition and monitor your audio through different streaming codecs. The individual meters to the right indicate the True Peak output after encoding. Unlike traditional limiters, ISL can be used to measure the inter-sample peaks that fall outside of individual sample points, and result in distortion when incorrectly reconstructed by down-stream codecs. Try using ISL to specify the output True Peak limit and preempt these inter-sample peaks, and avoid potential codec distortion in music service streams further down the line. MasterCheck can be used in mid/side mode to examine the mid/side relationship of the PLR (Peak to Loudness Ratio) values when using mid/side compression techniques. Click the ‘M/S’ button in the plug-in to switch the metering into mid/side mode. When mid/side is active, the bar meters will split to show mid and side readings instead of left and right. In this mode, the main PLR and program loudness values are still derived from the complete stereo mix, only the bar meters switch to Mid/Side. This feature proves very useful in situations where independent processing of mids and side audio is required, whilst at the same time contextualising the mid/side information with the overall loudness readings. MasterCheck can also be used to compare your tracks to reference material in order to measure the differences in loudness, PLR and True Peak readings. The NUGEN Audio SEND plug-in is installed with MasterCheck. This can be used to 'tap' the signal at any point in the chain and send the audio through MasterCheck. To make a comparison between your audio and a reference track, create a new track with your reference audio and insert the SEND plug-in on this track. Place MasterCheck as you usually would to monitor your mix and click the 'External ref.' button. MasterCheck will now replace the target loudness value in the bottom left with the loudness measurement from the reference track. The PLR of the reference track will also be shown in the PLR window. You can monitor the reference audio by clicking the speaker button. If you wish, you can use the 'Offset to match' control to match the loudness of your material to the reference audio. As these values are constantly updated, there may well be some drift over time. Use the circular refresh button to recalibrate if required. Using MasterCheck to remove loudness from an FX chain can be a very useful technique to employ when trying to evaluate the effect of processing without being influenced by the 'feel good factor' of increased loudness. Generally speaking, if you turn up some audio, it sounds better. This can be problematic when attempting to make an objective assessment of any form of processing that affects the loudness (e.g. a compressor or limiter), because the loudness increase alone will make things sound better. MasterCheck can be used to 'remove' the loudness difference by matching loudness before and after effects, so the effect without loudness can be auditioned, making it much easier to assess the contribution of the processing involved. The process is very similar to comparing your audio to reference material (see above) except we are now comparing with the same track, before and after processing. If you would like to put these into practice, try a demo of the Modern Mastering bundle to hear the difference it makes! 2/6 HOW LOUD IS TOO LOUD? 3/6 NO-ONE IS LISTENING TO YOUR MIXDOWN! Master effortlessly with 3 plug-ins. Work with confidence and precision for today’s digital delivery streaming services. Optimising your mixes for today’s music delivery services. MasterCheck reveals problems ahead of time, and enables you to audition and deliver masters perfectly tuned for today’s playout systems.